Chimani founder Kerry Gallivan finds his way out of the rain and into the wilderness. In 1992, as a restive college student with a yen for international travel, Kerry Gallivan secured an internship with an organization called SatelLife. Gallivan’s task was to travel to Zimbabwe and establish communications between remote ground stations and an orbiting satellite in order to access internet-based medical information. SatelLife was the inspiration of Bernard Lown, the world-famous heart surgeon who grew up in Lewiston and invented the defibrillator. While in Zimbabwe, Gallivan discovered there was an Outward Bound School on the border between Zimbabwe and Mozambique in the remote Chimanimani Mountains National Park. He signed up for a course. Gallivan’s Outward Bound instructors drilled their students on the three rules for hiking in the Chimanimani wilderness: the first person on a trail would always carry a stick, as a protection against deadly poisonous snakes; no one would leave a trail, due to the landmines that remained after Zimbabwe’s brutal war for independence; and no one would wander from campsites at night, due to the danger of leopards. By the end of his Zimbabwean internship, Gallivan had proved dauntless enough with new challenges and handy enough with developing countries’ internet technology to be offered a full-time job with SatelLife. Gallivan spent the next five years delivering modems and other internet equipment to isolated medical facilities throughout sub- Saharan Africa and Southeast Asia. Gallivan decided he would enshrine his life- changing experiences in Africa by registering Chimani.com as a website domain name. For what purpose, he had no idea; that would come years later. Eventually technology and internet connectivity strategies changed throughout Africa, making SatelLife less relevant. Gallivan settled down for a more rooted life at the Boston University School of Public Health at the beginning of the dot-com era. Gallivan married and had a daughter, then a son. He started looking for jobs in Maine because he wanted a better quality of life for his young family than was within his reach in Boston. Gallivan soon landed a job in the technology department in the school system in North Berwick and later moved to similar positions in Freeport and Topsham school districts. In 2009, Gallivan was back in the wilderness, emotionally and geographically. 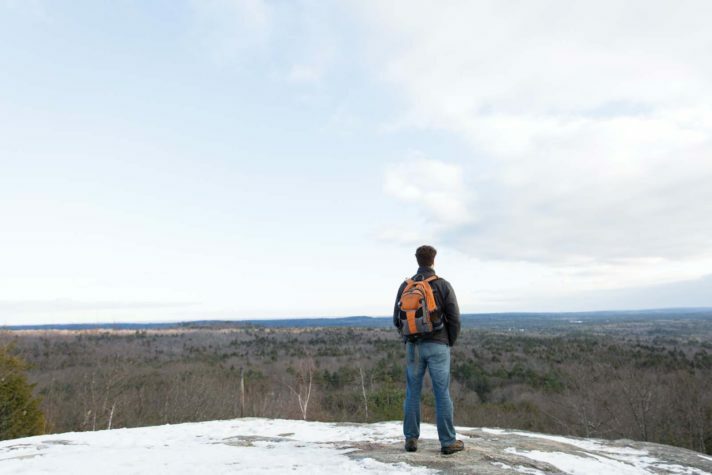 His marriage was unraveling, and he felt “the need to get out into the woods to find a way forward—to give me something to focus on.” On a raw April day in Acadia National Park, Gallivan began climbing the Gorham Mountain Trail, not far from where he had camped the night before. It began to rain and he had no map to help him figure out the shortest route back. Recalling how he had lugged large laptops to remote hospitals in Africa, it occurred to him that he now had a computer in his pocket—his first-generation iPhone. This was his “aha moment.” Why not create a mobile app for his phone that could give him trail information, maybe even lodging options and directions to the nearest restaurants? Suddenly, he saw a possible route out of his wilderness—he would develop the app for parks in the United States and call it Chimani. Before meeting Gallivan, I wanted my own experience of bringing technology into the outback. I downloaded Chimani on my phone, opened the map section of the app, located the Gorham Mountain Trail, and headed to Acadia shortly after sunrise on a still-mild December morning to retrace Gallivan’s mountain trek with app in hand. Acadia’s Park Loop Road was clear of most traffic as I parked near the Gorham Mountain trailhead and headed out, carefully skirting the patches of ice from an intense rainfall that had frozen solid on the sloping granite trail. After a spectacular hike under Cadillac Cliffs to the Gorham Mountain summit, the view over Frenchman Bay, looking beyond Schoodic Point toward eastern Maine, was breathtaking. It might seem natural to a millennial to carry this kind of technology into parks and wilderness, but I wondered whether it would be a harder sell for older visitors, an important demographic for U.S. parks. For an answer, I headed over to Bar Harbor for a conversation about Chimani with David MacDonald, head of Friends of Acadia, a nonprofit that helps advocate for—and fund—Acadia’s priorities. Gallivan later provided an international context for Acadia’s challenges managing its popularity. “U.S. parks are a global destination,” he tells me. “There are eight billion visitors to national parks and preserves worldwide—about 80 percent of those visits are in North America and Europe. There were 330 million visitors to U.S. parks last year—14 million were international tourists,” he says. “How do you help people have a good experience?” During a recent visit to Grand Canyon National Park, he saw the problem made concrete at the headquarters building. “There was a line snaking out the door into the parking lot with one or two rangers inside, and everyone was asking the same questions.” An app like Chimani could answer those questions, letting visitors find their answers online and get into the wilderness without waiting in line. Gallivan has been developing Chimani for the past seven years—full-time for the past three—searching for the right balance between free content and revenue generation. Gallivan says that Chimani is now at a “classic pivot point—trying to stay afloat and moving ahead.” Although the Chimani app will remain free, this spring the company will offer new services for a fee. One will be a Park Perks program that lets visitors buy a virtual discount card to use in park gift stores and for discounts on meals and lodging with cooperating partners. Another service Gallivan and Chimani are planning is a chat-based concierge service, powered by both people and artificial intelligence, to answer questions like: Are there any rooms available at Old Faithful Inn at Yellowstone? Where is the best place to see a sunset at Zion National Park? Can I buy a park pass for Acadia online?